The year has started with a bang and settled to a fizz, and now you are starting to think about what events and marvels will unfurl. Europe has always had a lot to offer travelers, with its sandy shores, historic castles and walled cities, and spectacular scenery. Yet a lot of Europe’s best offers take place only once a year, or even less. From festivals to sporting events to more tomatoes than you can imagine, here are the top events to attend. This year marks the 19th series of the Six Nations Championship, or the 124th edition if you include the tournament’s past iterations. Defending champions England are back, along with France, Ireland, Italy, Scotland and Wales. The action gets started on February 3rd at the Millennium Stadium where Wales will face Scotland. The competition continues until March 17th, so you have quite a few chances to watch the top teams in Europe battle it out. Take a look at the Six Nations fixtures and odds before the tournament starts to get a feel for the favorites. Next on the calendar is the Copenhagen Jazz Festival, from the February 3-26. Copenhagen is Europe’s jazz capital, and this event is the largest of its kind, so you can expect to see raw talent and plenty of spectacle along with 10 days of music spread across 100 venues — cafes, concert halls, open-air stages and street performances will host 1,000+ concerts! If dance music is more your style, then head to one of Europe’s many EDM festivals. Ultra Music Festival is a great choice if you want to party with thousands of other revelers in stadiums, beaches and boats. Set on the beautiful shores of Croatia, previous acts include the Chemical Brothers and Deadmau5. The festival takes place from June 14-16. Tickets are pricey and difficult to get a hold of, so you could also consider one of Europe’s many other festival offerings. You could take a little rest and sunbathing time in July because August is a busy month across Europe, and one of the best times to catch the most cultural events. Notting Hill Carnival is held on the August bank holiday in London (W11 postcode) and has been a hotbed Afro-Caribbean culture and expression since 1946. Expect bright colors, sounds, costumes and plenty of street parties to get the heart pumping. Over in Zurich, a different kind of carnival takes place on August 11th. Known as the “Street Parade”, this is the biggest techno march in the world with a 2.4km stomping ground and 100’s of parties. 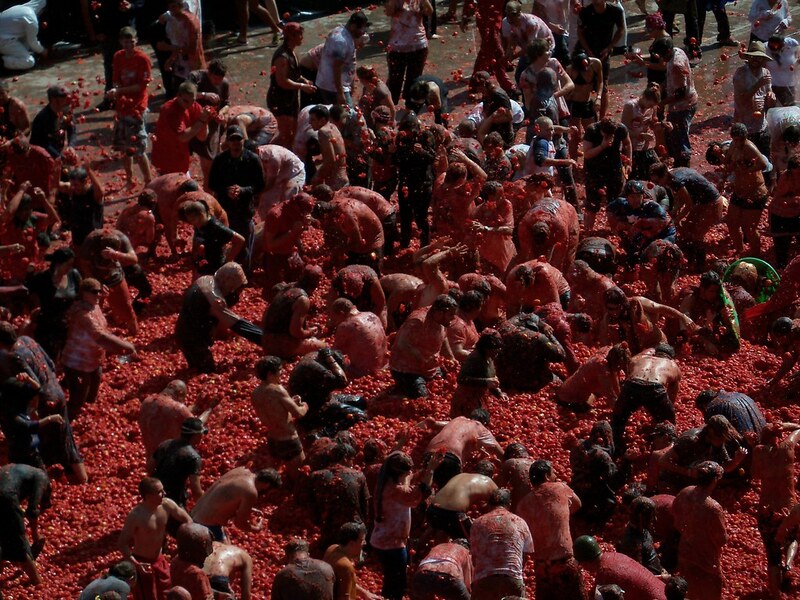 Meanwhile, over in the small town of Bunol in Spain, on the last Wednesday in August, thousands of people hurl tomatoes at each other at “La Tomatina” for a bit of messy fun! You may think that the year of festivities was nearing the end after August, but as the long, dark winters draw closer, don’t get your slippers on just yet. The end of September and start of October are the time for “Oktoberfest,” a massive event with drinks, brass bands, costumes, parades, contests and an all-out display of Bavarian culture. You deserve a bit of a rest, so once you come down from Oktoberfest, we recommend heading elsewhere for warmer shores and taking a breather. If you do want to end the year with a bang, head to Edinburgh for the three-day long NYE Festival, which culminates in an epic firework display over the castle. It’s like a scene from a fairytale!